Don't forget, tonight's the release show at the Artesian in 13th (with after party at German Club - two-tiered night on getting bawmed. Come right at 8 to catch Young James. Hope to see you there! Tix are selling quick, so run down to Buy The Book or Mysteria. We have a second record ready to go, as well as an accompanying show to welcome it appropriately. This night is bound to be a fun night, lots of music, lots of drinking and lots of fun! 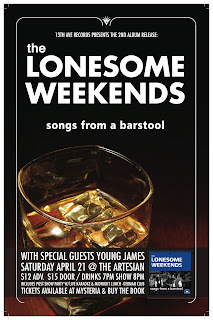 SONGS FROM A BARSTOOL contains a dozen tunes to remind you that country and rock were meant to be together, much like heartache and whiskey, honky-tonks and dancing, and Saturday nights and fighting. An album that proves that country and rock continue to drink, dance and fight together. It may well be the only album Ernest Tubb and Jeff Tweedy could agree on. "I can be your valentine." I need a little more to drink. Our new record SONGS FROM A BARSTOOL will be out April 21. We recorded the 12-song album in April 2011 at SoulSound Studios with Orion Paradis. We'll be releasing the single very soon. Release show details coming soon, we can guarantee it is going to be a fun night. - Our next hometown show is part 2 of our German Club series and it will be on Feb. 4. 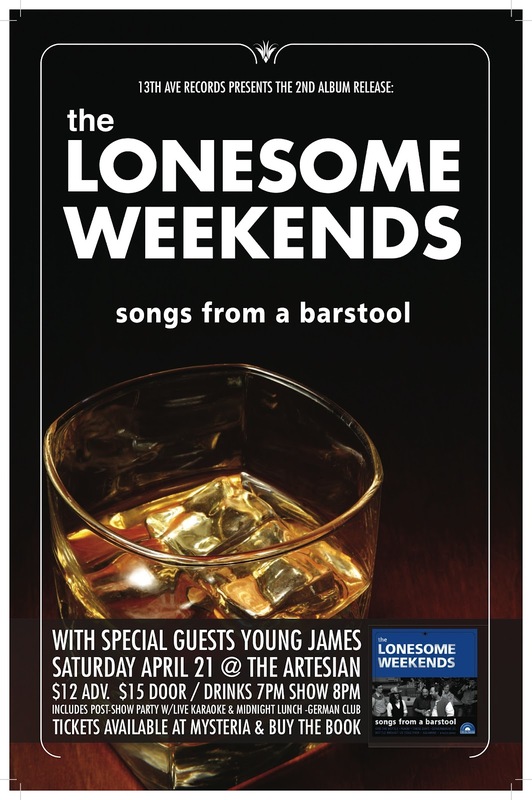 You want to sing with us, then you'd best come out to "Sangin' With The Lonesome Weekends: Live Country Karaoke." Click here for details. - Just got reviewed in exclaim! - Gettin' some airplay across the country! Thanks to all the stations: CJSW, CJSR, CJSF, CFBX, CITR, CKUA, CFBU, CFRE, CHMA, CHRW, CHUO & CJAM. Thanks to Lisa! - We have a new facebook page, for those of you who are into that.